Product prices and availability are accurate as of 2019-01-21 07:13:46 GMT and are subject to change. Any price and availability information displayed on http://www.amazon.com/ at the time of purchase will apply to the purchase of this product. 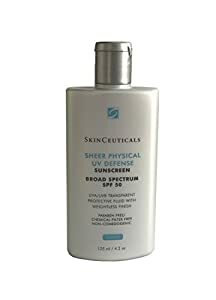 A groundbreaking first-to-market mattifying fluid with transparent surface, this paraben-free, all-physical filter sunscreen offers increased protection in an ultra-sheer texture for all skin types, even very sensitive. Sheer physical uv defense SPF 50 provides the photoprotection of relied on broad-spectrum, physical filters, zinc oxide (z-cote) and titanium dioxide, and is improved by artemia salina, a plankton extract, to increase the skin's defenses and resistance to uv and heat tension. The distinct 'shake then apply' action guarantees even distribution of active components in this smooth sheer fluid that dries quickly and leaves no residue.